Bring your friends, have fun and dance or just watch and listen to the beautiful old time music. Enjoy the tea, sandwiches and cakes and bring along a box of your regular tea bags and swap them for a box of top quality Imporient Fairtrade tea. With The Palm Court Dance Orchestra. Special guest.....Nioka Abbott-Balcombe a Fairtrade banana producer from the Windward Islands. Cheques and proceeds of Mikron handed over and agreed that Chris be paid for use of the church for the Mikron event.Liz not yet been paid for ad. Thanks noted to Bradford Fairtrade group for their continued financial support. Chris proposed the showing of the film 'The age of Stupid' about climate change set in 2050. Date to be confirmed possibly last week in November. Liz suggested also 'Vanishing bees' which is sponsored by the Co-op. 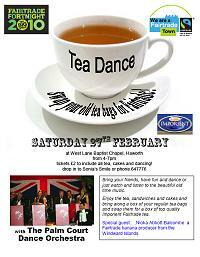 Decision made to hold a tea dance. Price to be confirmed but entry by a box of tea bags to be exchanged for Fairtrade ones. Kathleen to bring to the attention of parishioners re women's day of prayer for possible help. Liz to ask Jens about contacting Ian Dewhirst re talk about history of tea dances. Liz to approach nursing home contacts. It is hoped that ticket sales will go well prior to the event. All agreed that we would like to host an event. Rita to request price for full day 3 locations. Liz to contact Paul at the Old Silent as discussed in previous meeting re weekly rotary evenings. We will offer to supply some FT wine etc as a taster, Also an opportunity to discuss signs and work together. Cookbook progress discussed. Rita and Ann to proof read and list anything else which needs to go in. We welcomed Rev Peter Mayo-Smith the new vicar at St Michaels and All Angels who is very keen to be involved. He offered a display in Church for Fairtrade Fortnight and will base a sermon on 7th March. If we can get all details confirmed asap they can be included in Community Pride. Shops and churches selling FT products.